The Puppy Playpen folding metal dog crate by MidWest Homes for Pets is the perfect place to raise your puppy while keeping them clean and safe. 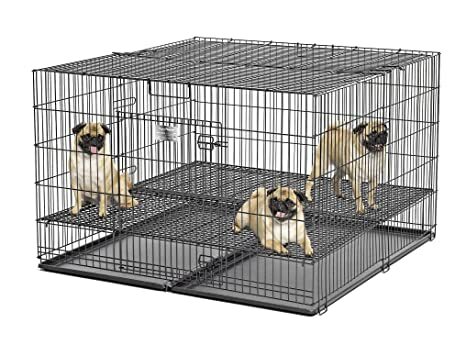 This durable metal Puppy Playpen is equipped with a 1″ spacing floor grid that is safe for your puppy’s paws while keeping them cleanly elevated off of the dog crate floor in the event they have an accident (we also have a inch spacing floor grid option if your dog / puppy has larger paws). The 1 inch spacing floor grid can be adjusted up or down to suit your growing puppy / puppies for longer use. This puppy playpen (model 224-10) measures 24.25L x 36.875W x 31.75H inches, features two easy to remove / clean leak proof replacement pans, a “paw friendly” floor grid with 1 inch spacing, a durable black e-coat finish and two points of access (front door and top panel) for convenient access to your dog. Our Puppy Playpens come in three different sizes (small, medium, large) with each option offering a floor grid with either inch spacing or 1 inch spacing making our Puppy Playpens suitable for a variety of dog breeds large and small. For safety purposes, we recommend removing your puppy / dog’s collar, leash or harness before placing them in the Puppy Playpen metal dog crate. We at MidWest Homes for Pets understand that your puppy dog is a part of your family and that’s why we ensure our Puppy Playpen dog crates are manufactured with the highest quality control standards creating a safe home for your pet that you can feel confident with. MidWest Homes for Pets stands behind the quality of our products with a 1 Year Manufacturer’s Warranty. If you have any questions about our folding metal dog crates our customer service department would be glad to help you. MidWest customer service can be contacted at: 1-800-428-8560, available 9:00 AM – 4:00 PM, Monday – Friday. Midwest Exercise Pen with Walk-Thru Door is durable and secure. The perfect option to give your pets good playing ground, both indoors and outdoors. Comes with a Maxlock door system, which gives you easy access to your pets or a great place to put your pet’s crate. Easy to set up without tools and the ground anchors and corner stabilizers give it extra security. Not recommended for puppies or dogs that jump. The black epoxy-coat finish provides long-lasting protection. Comes with 8 panels. 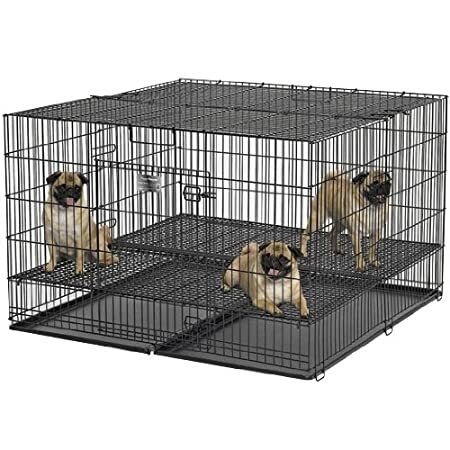 The extra (extra, extra, extra) large double door metal dog crate by MidWest Homes for Pets, Solution Series (model SL54DD), is a metal dog crate specifically designed for the largest breed of dogs including Great Danes, Mastiffs, St. Bernard’s, etc.. This dog crate is so large that we recommend two people for assembly. 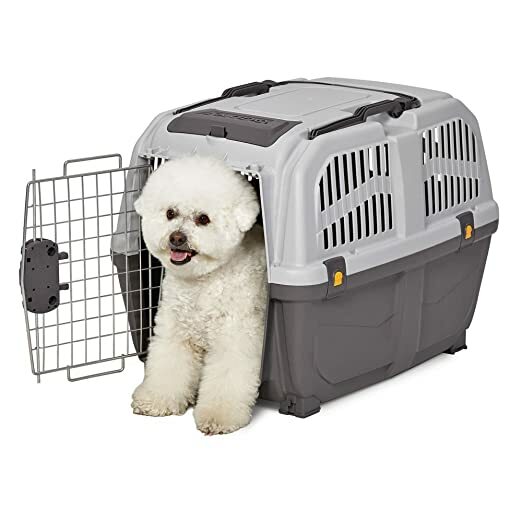 This is an extra-large, durable, heavy duty metal dog crate that features a two-door configuration with convenient front & side door access, three secure slide-bolt latches per door & a tough easy to clean leak-proof plastic pan. This “Ginormous” dog crate utilizes drop-pin construction (4 drop-pins) ensuring maximum durability to safely and securely handle large breed dogs. This giant dog crate is also equipped with our patent-pending “L” Bar that horizontally runs along the middle of the top panel of the dog crate so the side panels do not bow inward after assembly ensuring a safe & sturdy dog crate for your dog. The “Ginormous” dog crate measures 54L x 37W x 45H and weighs 80.2 pounds. We at MidWest Homes for Pets understand that your dog is a part of your family and that’s why we ensure our dog crates are manufactured with the highest quality control standards creating a safe home for your pet that you can feel confident with. MidWest Homes for Pets stands behind the quality of our products with a 1-year Manufacturer’s Warranty. If you have any questions about our dog crates our customer service department would be glad to help you. MidWest customer service can be contacted at: 1-800-428-8560, available 9:00 AM – 4:00 PM, Monday – Friday. MidWest Homes for Pets wants to help you minimize the stress of having a new puppy while maximizing your enjoyment with your new best friend! ! To do that, we want to offer you our new iCrate Double Door Crate Kits that include everything a new pet parent needs to get started: including, 1 Double Door iCrate, 1 crate-sized bed, 1 privacy crate cover & 2 appropriately-sized pet bowls. We designed this kit to ensure your puppy has a smooth transition into their new forever home. With proper use of the dog crate your puppy will learn how to be housetrained quickly and with fewer accidents. 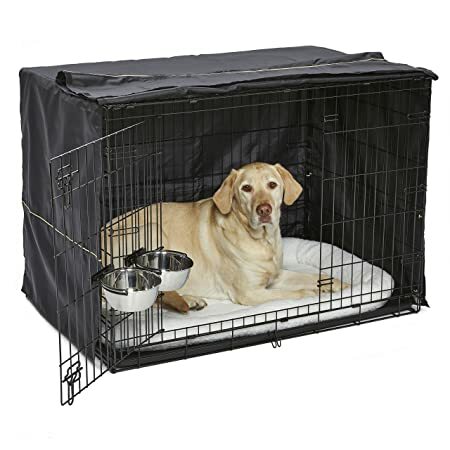 The pet bed will create a cozy atmosphere for your pet & the privacy crate cover reduces anxious behavior & creates a more den-like home your dog instinctually desires. We also included two stainless steel pet bowls that attach to the dog crate keeping food & water in one convenient location. This specific kit features a 42-inch long double door dog crate that is ideal for large dog breeds. This dog crate measures 42L x 28W x 30H – inches, the pet bed and crate cover are also machine washable & dryer safe. We at MidWest Homes for Pets understand that your dog is a part of your family and that’s why we ensure our dog crate kits are manufactured with the highest quality control standards you can feel confident with. MidWest Homes for Pets stands behind the quality of our products with a MidWest Guarantee 1-Year Manufacturer’s Warranty. If you have any questions about our kits our customer service department would be glad to help you. MidWest customer service can be contacted at: 1-800-428-8560, available 9:00 AM – 4:00 PM, Monday – Friday. Midwest home for pets makes your pet’s life more exciting and pleasant. Grooming tables and accessories are unique tables exclusively designed for pets. Made from durable materials and fine finishing, this is definitely the kind of pet grooming table that you can’t afford to miss. Midwest grooming tables are very rigid, sturdy and easily setup. They are also easy to clean and maintain with a inch no-slip inch rubber working surface. These grooming tables can also be accessorized with grooming arm, security loop and a universal grooming table shelf where you can place your dog’s other things. The Midwest Skudo Plastic Pet Carrier is the ideal solution when traveling with your pet. Made of durable plastic, this pet carrier features a metal grid door and a convenient carrying handle. Snap-lock buckles ensure easy assembly while the vents provide circulation and optimal visibility. Available in 6 sizes, the Midwest Skudo carrier is sure to provide your pet with the necessary needs to be safe and comfortable while traveling. The Puppy Playpen folding metal dog crate by MidWest Homes for Pets is the perfect place to raise your puppy while keeping them clean and safe. This durable metal Puppy Playpen is equipped with a 1/2″ spacing floor grid that is safe for your puppy’s paws while keeping them cleanly elevated off of the dog crate floor in the event they have an accident (we also have a 1 inch spacing floor grid option if your dog / puppy has larger paws). The inch spacing floor grid can be adjusted up or down to suit your growing puppy / puppies for longer use. This puppy playpen (model 248-05)) measures 48.5L x 49W x 31.75H inches, features two easy to remove / clean leak proof replacement pans, a “paw friendly” floor grid with inch spacing, a durable black e-coat finish and two points of access (front door and top panel) for convenient access to your dog. Our Puppy Playpens come in three different sizes (small, medium, large) with each option offering a floor grid with either inch spacing or 1 inch spacing making our Puppy Playpens suitable for a variety of dog breeds large and small. For safety purposes, we recommend removing your puppy / dog’s collar, leash or harness before placing them in the Puppy Playpen metal dog crate. We at MidWest Homes for Pets understand that your puppy dog is a part of your family and that’s why we ensure our Puppy Playpen dog crates are manufactured with the highest quality control standards creating a safe home for your pet that you can feel confident with. MidWest Homes for Pets stands behind the quality of our products with a 1 Year Manufacturer’s Warranty. If you have any questions about our folding metal dog crates our customer service department would be glad to help you. MidWest customer service can be contacted at: 1-800-428-8560, available 9:00 AM – 4:00 PM, Monday – Friday. The Puppy Playpen folding metal dog crate by MidWest Homes for Pets is the perfect place to raise your puppy while keeping them clean and safe. 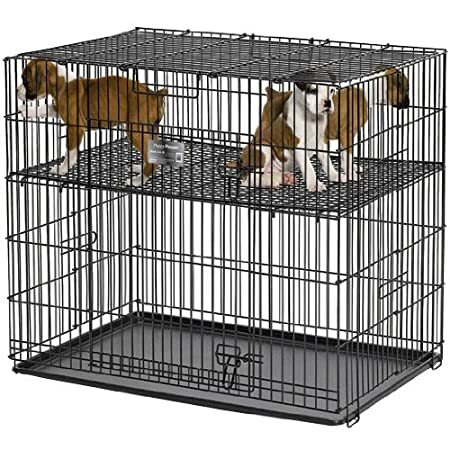 This durable metal Puppy Playpen is equipped with a 1/2″ spacing floor grid that is safe for your puppy’s paws while keeping them cleanly elevated off of the dog crate floor in the event they have an accident (we also have a 1 inch spacing floor grid option if your dog / puppy has larger paws). The inch spacing floor grid can be adjusted up or down to suit your growing puppy / puppies for longer use. This puppy playpen (model 224-05) measures 24.25L x 36.875W x 31.75H inches, features two easy to remove / clean leak proof replacement pans, a “paw friendly” floor grid with inch spacing, a durable black e-coat finish and two points of access (front door and top panel) for convenient access to your dog. Our Puppy Playpens come in three different sizes (small, medium, large) with each option offering a floor grid with either inch spacing or 1 inch spacing making our Puppy Playpens suitable for a variety of dog breeds large and small. For safety purposes, we recommend removing your puppy dog’s collar, leash or harness before placing them in the Puppy Playpen metal dog crate. We at MidWest Homes for Pets understand that your puppy dog is a part of your family and that’s why we ensure our Puppy Playpen dog crates are manufactured with the highest quality control standards creating a safe home for your pet that you can feel confident with. MidWest Homes for Pets stands behind the quality of our products with a 1 Year Manufacturer’s Warranty. If you have any questions about our folding metal dog crates our customer service department would be glad to help you. MidWest customer service can be contacted at: 1-800-428-8560, available 9:00 AM – 4:00 PM, Monday – Friday. The Puppy Playpen folding metal dog crate by MidWest Homes for Pets is the perfect place to raise your puppy while keeping them clean and safe. 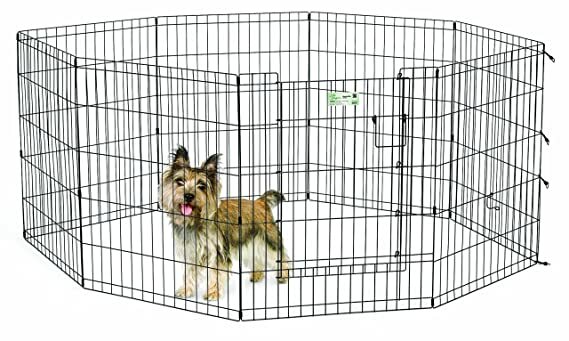 This durable metal Puppy Playpen is equipped with a 1/2″ spacing floor grid that is safe for your puppy’s paws while keeping them cleanly elevated off of the dog crate floor in the event they have an accident (we also have a 1 inch spacing floor grid option if your dog / puppy has larger paws). The ½ inch spacing floor grid can be adjusted up or down to suit your growing puppy / puppies for longer use. This puppy playpen (model 236-05) measures 36.75L x 37.25W x 31.75H inches, features two easy to remove / clean leak proof replacement pans, a “paw friendly” floor grid with ½ inch spacing, a durable black e-coat finish and two points of access (front door and top panel) for convenient access to your dog. Our Puppy Playpens come in three different sizes (small, medium, large) with each option offering a floor grid with either ½ inch spacing or 1 inch spacing making our Puppy Playpens suitable for a variety of dog breeds large and small. For safety purposes, we recommend removing your puppy / dog’s collar, leash or harness before placing them in the Puppy Playpen metal dog crate. We at MidWest Homes for Pets understand that your puppy dog is a part of your family and that’s why we ensure our Puppy Playpen dog crates are manufactured with the highest quality control standards creating a safe home for your pet that you can feel confident with. MidWest Homes for Pets stands behind the quality of our products with a 1 Year Manufacturer’s Warranty. If you have any questions about our folding metal dog crates our customer service department would be glad to help you. MidWest customer service can be contacted at: 1-800-428-8560, available 9:00 AM – 4:00 PM, Monday – Friday. 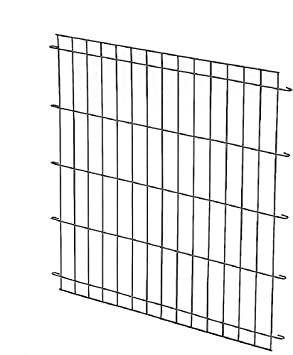 This Divider Panel fits the Midwest Folding Dog Crates Only. A Divider Panel adds versatility to your pet home and saves you money by allowing you to adjust the size as your puppy grows. 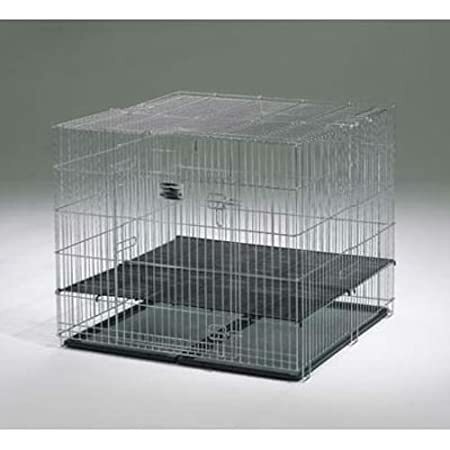 In most cases, you should buy a cage large enough for your dog when he grows up. However, if the cage is too big when your pup is small, he may eliminate in one corner, then go to another corner to sleep. The Divider Panels are available to solve this problem. MidWest Homes for Pets is proud to offer a trusted, affordable, and portable outdoor containment solution for dogs. The K9 Kennel features a strong and sturdy steel frame with secure chain-link construction. The patented design provides maximum stability with interlocking steel tubes that have rounded corners for safety. K9 Kennel sets up quickly and easily in just 30 minutes and requires only a set of pliers no need for additional tools or hardware. The lightweight design makes K9 Kennel portable and easy to reposition. The secure and convenient one-handed latch that allows you to open and close the door easily while handling your dog. K9 Kennel comes with a woven polyethylene sunscreen to keep your dog cool and provide them with greater protection against the sun. Available in three sizes, K9 Kennel is able to accommodate all breeds as well as multiple dogs. All MidWest Homes for Pets kennels come with a 1-Year Manufacturer’s Warranty. If you have any questions about our outdoor enclosures, our customer service team can be contacted at 1-800-428-8560, 9:00 AM – 4:00 PM, Monday Friday (EST). If you want to spoil your best friend (whether they be a dog or a cat…) the plush, tufted and over-stuffed QuiteTime Deluxe Coco Chic Pet Bed by MidWest Homes for Pets is the perfect pet bed for you! Each pet bed is available in multiple sizes that are perfectly suited for almost any breed of dog or cat. The neutral coco brown color of our Coco Chic dog / cat beds complement any home dcor and the plush, silky-soft synthetic fur provides your pet a cozy bed for rest and relaxation. All Coco Chic pet beds feature a no-slip surface on the bottom thats perfect for hardwood or tile floors. They are machine washable and dryer safe, and they are sized to fit inside most standard dog crates creating a comfortable and desired location for your dog or cat to relax. MidWest Homes for Pets stands behind the quality of our products with a 1-Year Manufacturers Warranty. If you have any questions regarding our dog beds or cat beds our customer service department would be glad to help you. MidWest customer service can be contacted at: 1-800-428-8560, available 9:00 AM 4:00 PM, Monday Friday EST. The Puppy Playpen folding metal dog crate by MidWest Homes for Pets is the perfect place to raise your puppy while keeping them clean and safe. This durable metal Puppy Playpen is equipped with a 1″ spacing floor grid that is safe for your puppy’s paws while keeping them cleanly elevated off of the dog crate floor in the event they have an accident (we also have a inch spacing floor grid option if your dog / puppy has larger paws). The 1 inch spacing floor grid can be adjusted up or down to suit your growing puppy / puppies for longer use. 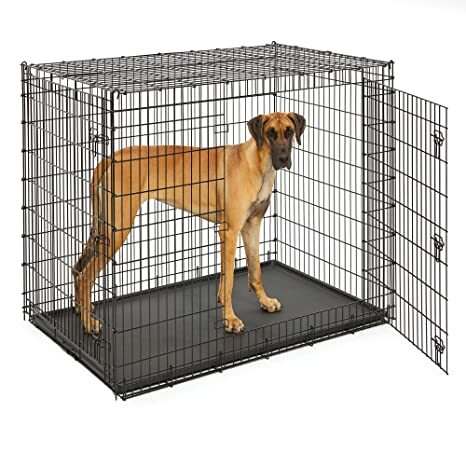 This puppy playpen (model 236-10) measures 36.75L x 37.25W x 31.75H inches, features two easy to remove / clean leak proof replacement pans, a “paw friendly” floor grid with 1 inch wire mesh spacing, a durable black e-coat finish and two points of access (front door and top panel) for convenient access to your dog. Our Puppy Playpens come in three different sizes (small, medium, large) with each option offering a floor grid with either inch spacing or 1 inch spacing making our Puppy Playpens suitable for a variety of dog breeds large and small. For safety purposes, we recommend removing your puppy / dog’s collar, leash or harness before placing them in the Puppy Playpen metal dog crate. We at MidWest Homes for Pets understand that your puppy dog is a part of your family and that’s why we ensure our Puppy Playpen dog crates are manufactured with the highest quality control standards creating a safe home for your pet that you can feel confident with. MidWest Homes for Pets stands behind the quality of our products with a 1 Year Manufacturer’s Warranty. If you have any questions about our folding metal dog crates our customer service department would be glad to help you. MidWest customer service can be contacted at: 1-800-428-8560, available 9:00 AM – 4:00 PM, Monday – Friday. The Puppy Playpen folding metal dog crate by MidWest Homes for Pets is the perfect place to raise your puppy while keeping them clean and safe. 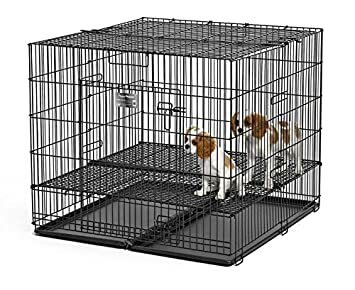 This durable metal Puppy Playpen is equipped with a 1″ spacing floor grid that is safe for your puppy’s paws while keeping them cleanly elevated off of the dog crate floor in the event they have an accident (we also have a inch spacing floor grid option if your dog / puppy has larger paws). The 1 inch spacing floor grid can be adjusted up or down to suit your growing puppy / puppies for longer use. 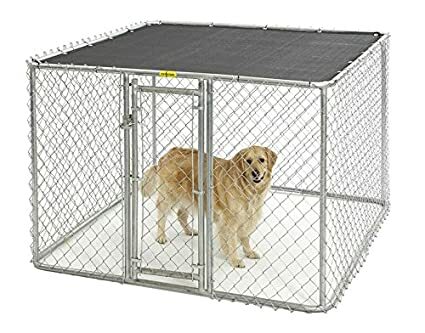 This puppy playpen (model 248-10) measures 48.5L x 49W x 31.75H inches, features two easy to remove / clean leak proof replacement pans, a “paw friendly” floor grid with 1 inch wire mesh spacing, a durable black e-coat finish and two points of access (front door and top panel) for convenient access to your dog. Our Puppy Playpens come in three different sizes (small, medium, large) with each option offering a floor grid with either inch spacing or 1 inch spacing making our Puppy Playpens suitable for a variety of dog breeds large and small. For safety purposes, we recommend removing your puppy / dog’s collar, leash or harness before placing them in the Puppy Playpen metal dog crate. We at MidWest Homes for Pets understand that your puppy dog is a part of your family and that’s why we ensure our Puppy Playpen dog crates are manufactured with the highest quality control standards creating a safe home for your pet that you can feel confident with. MidWest Homes for Pets stands behind the quality of our products with a 1 Year Manufacturer’s Warranty. If you have any questions about our folding metal dog crates our customer service department would be glad to help you. MidWest customer service can be contacted at: 1-800-428-8560, available 9:00 AM – 4:00 PM, Monday – Friday.